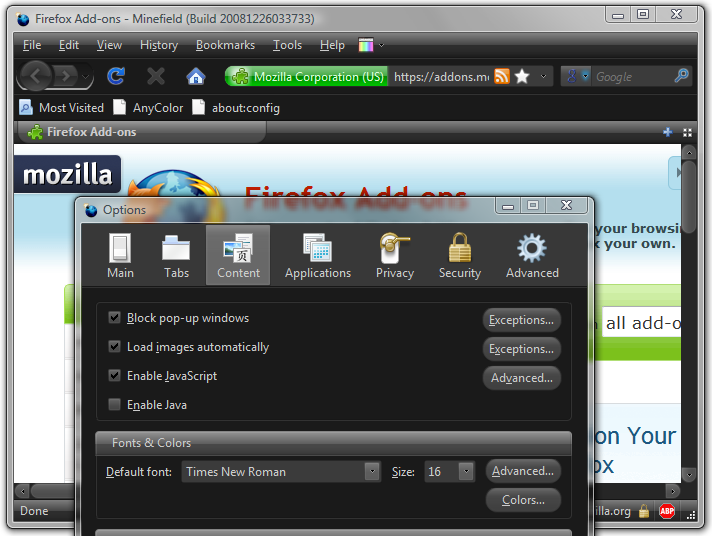 A new version has been uploaded to addons.mozilla.org and it should appear in a few hours. You can also find it here (sha1: b6d3adb7f66d766fad3241e1657e85bd21bc75e2). A dark preset with gloss enabled. The most noticeable change in this release is the “Gloss” theme tweak. I was reluctant to add this at first but I’ve been using it for about two months and it looks great! Added the “Gloss” theme tweaks. There are two, one adds gloss to the Bookmarks toolbar and the other to the Tabs. You can enable both if you like; I personally like the Tabs one better. Improved the “first run” page. It will now show a list of the available presets and a few selected theme tweaks. Marked the “Strata Reloaded” theme as compatible, it looks great with the gloss tweak enabled and near-black colors. Minor fix for XUL progress bars when value is zero. Styled the links in view source (Fx 3.1+). Added a tweak for the scrollbars. Visual fix for the mini-buttons in the update dialog. Added Russian translation by Timur.